This week we’re travelling to India for some good news! Tamil Nadu is an Indian state known for its Jallikattu-bullfights, where men wrestle bulls to win prizes tied to the bull’s horns. 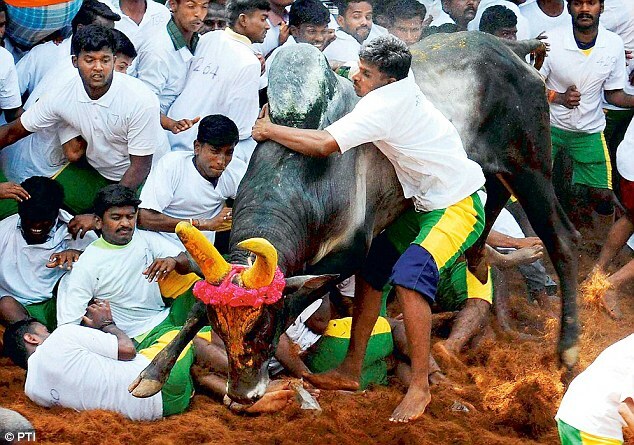 India has argued for years that it’s not inhumane because the bulls don’t necessarily die, though many bulls and humans are killed during the so-called festivities. But Jallikattu won’t happen anymore. 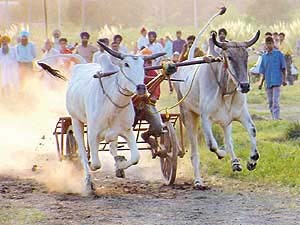 India’s Supreme Court ruled that the jallikattu and bullock-cart racing, cart races that use bulls, severely harm the animals and violate India’s Prevention of Cruelty to the Animals Act. This certainly won’t sit well with the Tamils, as they have been participating in these types of events for a very long time. And animal welfare advocates aren’t resting on their laurels, either. It seems the Supreme Court issued a similar ruling in 2008, then reversed itself several days later. But for now, bulls are breathing a sigh of relief in India. Lets hope they keep it and enforce it. Sometimes people turn a blind eye to traditional activities regardless of the legality. Yes, the ruling doesn’t mean the cruelty will stop. I had no clue. Glad it won’t happen anymore. Have a lovely Sunday. Let the humans pull the carts!!!! Wow. I had no idea. Great day indeed! Hope dey enfowce it. Da only purrawlem wiff da laws is dat dey gotta be infowced and dat dusn’t always hapun. Happy Muddew’s Day. Hi Rumpy. thank you for following my blog! Hugs to the other fur folk and Jen. happy Mother’s day to Jen as well. That’s certainly good news, especially from a country like India where human life isn’t often valued. I wish México and other countries would ban bullfighting, which is equally cruel and inhumane. I love it, though, when the bull fighters get gored and / or trampled by the enraged animal. I never heard of this practice. BARBARIC!!!! Now if they would just stop bull fighting in Spain, the world would be a much happier place! Paws crossed it gets enforced and remains in effect. More. More. More like this. You should probably come to Spain and do the “running with the bulls” in Pamplona. Cause we are running these guys are actually fighting a bull, I´m not going near that thing even if they pay me.